Whether you’re on the right or on the left, there appears to be a consensus about at least one thing when you talk about ethics reform in the Georgia General Assembly. Any meaningful effort to improve trust and integrity in our state elected representatives, and their relationship with lobbyists and other special interests, runs into a world of hurt at the office door of House Speaker David Ralston’s Gold Dome suite. “I think we have a good strong record on ethics in the House and I’m proud of that,” the Speaker told a group of Republican supporters in Cobb County, earlier this month. The problem is, Ralston is one of the worst offenders – well, offenders may not be right because it’s all legal – in taking lobbyists’ money. In the three sessions since he was elected speaker, he accepted over $59,000 in gifts, including over $20,000 in food and drink, and a questionable $17,000 trip to Europe for his entire family, paid for by a lobbyist who was promoting high speed rail as part of the Transportation Local Option Sales Tax (T-SPLOST). The latter shocked Georgia Republicans so much, it is often pointed to as one of the reasons the referendum, also on next Tuesday’s ballot, is doomed to fail in most regions of the state. “That is what I call uncontrolled lobbying,” said Nolen Cox, GOP chair in Lowndes County. Cox is also part of the Georgia Conservatives in Action, one of the groups participating in the bipartisan Ethics Express, a community of progressive and conservative organizations touring the state in support of Question 2 on both parties’ primary ballots. “If you’re the party in charge, you have to lead. When we were the minority party, and the Democrats were in charge, we were the party pushing for ethics reform,” State Rep. Jason Spencer (R-Waycross) told Prose and Thorn, Thursday. “There are those who would sow the seeds of dissension and discord in order to advance a self-absorbed agenda that’s not consistent with the best interests of our party,” he told the delegates. But despite his warning, “as for me and the people’s House of this state, we are going to stand united, working hard, standing Republican shoulder to Republican shoulder,” the convention delegates shrugged and agreed to put the ethic question on the primary ballot by acclimation. 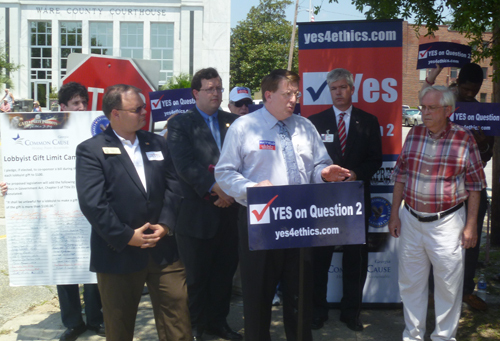 Spencer, who traveled with the Ethics Express to stops in Waycross and Brunswick, Georgia, was the first of only two incumbent Republicans to sign the group’s Lobbyist Gift Cap Campaign Pledge, a vow by State Assembly candidates to push for the cap in the upcoming, 2013 session of the legislature. Diane Cox agrees. “That is our ultimate goal,” she said. Next Post Is ethics reform in Georgia the key to common ground? The proposed lobbyist gift cap will be the first and only law to address the limits of what a lobbyist can gift a legislator. It is apparent that this law needs to be passed in order to end lobbyist unlimited spending—one only needs to look at it to see this. Now, there is nowhere in the gift cap pledge that promises a complete ethics transformation as a result of the gift cap. But, the pledge does work towards a more ethical way to handle lobbyist to legislator gift distribution. Although there are numerous pages of laws governing lobbyist, they have not and will not cut it. We need something else, something more, to truly define lobbyist, legislator relations. It seems as though Representative [Buzz] Brockway’s (R-Lawrenceville) idea of what the gift cap pledge entails is a tad bit misconstrued. Brockway does not only feel that the lobbyist gift cap is unnecessary, but also that “when people realize how a gift cap doesn’t change a thing they will be angry.” As we pointed out in an earlier blog post , lobbyist caps don’t just do nothing, or even lead to more corruption. After all, “saying that lobbyist caps lead to increased corruption should mean that Georgia is one of the least corrupt states, and yet we aren’t.” The gift cap is in no way meant to hinder anyone, nor cause corruption. It is to restore order that this state desperately needs.